Built for performance, finished for looks, loaded with features. In what seems to be a response to NVIDIA introducing their epic TITAN Z graphics card a few weeks ago, AMD has just unveiled their own contender. The Radeon R9 295X2 is not only the fastest graphics card ever built by AMD, it also costs half as much as the TITAN Z and will be launching with a price tag of $1500. The R9 295X2 features two AMD Radeon R9 290X ASIC GPUs with 2816 shaders running at 1018MHz. This clock speed is faster than the R9 290X — AMD’s speediest single-GPU graphics card — and is the fastest Mantle-enabled graphics card on the market. With this card installed in your PC, you’ll be able to game at speeds you didn’t even think were possible. To get the most out of the card, AMD placed the ASIC chips under an Asetek-built liquid cooling system. The integrated pump and waterblock assembly sits atop a high-turbulence plate and cools each chip individually. To cool the loop, AMD installed a 120x120mm single thick radiator. Because water is 24 times more effective than air at absorbing and transferring power, you won’t ever have to worry about overheating the R9 295X2. Such powerful hardware requires even more powerful monitors. This graphics card is capable of supporting up to five simultaneous displays and with a little bit of tweaking you could even try some 12K gaming. But to utilize the entire resources of this card, you’ll need a display that is larger than 3840×2160. There’s no doubt that this card will offer impressive gaming performance, but you’ll also need to upgrade your monitors. As dual-GPU graphics cards become more mainstream, we can only expect them to get better and (hopefully) less expensive. The AMD Radeon R9 295X2 is proof that you can pack virtually all the best components into a single unit and experience gaming at UltraHD resolution with incredible speed. And isn’t that what PC gaming is all about? 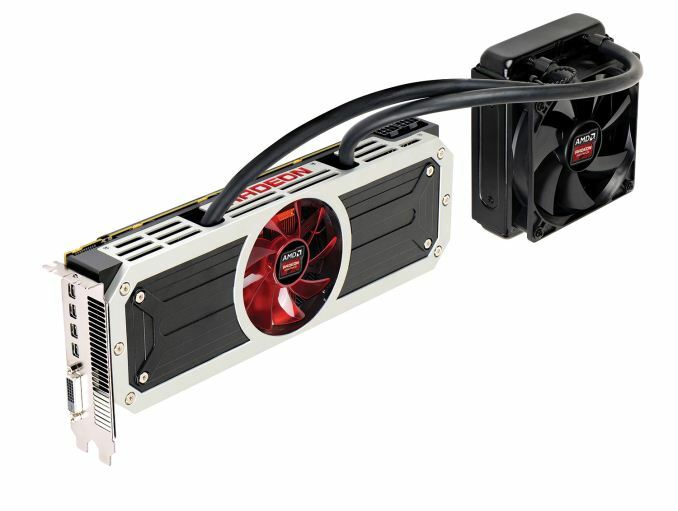 The AMD Radeon R9 295X2 will be available on April 21st and retail for $1500. To read more about gaming hardware, visit GameCrate. Since in the first to comment does this mean i get one for free? No, I’ve already sold my soul to amd ** u Breh send it to me!!!!!!! so it can run crisis? I wonder how well this will stack up against the Titan for GPGPU. Its 8GB for those who wish to know. I wonder how the performance stacks up against the Titan Z. Not that I will be getting either of them. It will run about as well as the Titan Z. The 295x gets +/- 1-2 fps vs Titans in SLI and the Titan Z is going to be underclocked to keep heat under control. But will it support Crossfire? The 295×2 is already has crossfired GPUs. So yes, it will support crossfire. So I can do my taxes on this thing and expect a bigger return? Where do you put the radiator? Outside your case? by the looks of it probably on an open fan mount. That’ll mine some serious Dogecoin.